Rock of Ages is mildly entertaining throughout, thanks to a colourful cast, a constant stream of decent-ish musical numbers and a scene-stealing baboon, but the plot is paper-thin, the characters are underwritten, there's a painful lack of laughs and the whole thing just isn't as much fun as it could have been. Directed by Adam Shankman (who made the far superior Hairspray remake), Rock of Ages is based on the popular eighties set Broadway/West End show (think Mamma Mia with bigger hair and power ballads). Julianne Hough (Footloose) stars as Sherrie, a small-town girl who arrives in Hollywood seeking a career as a singer and immediately falls for city boy Drew (Diego Boneta), who bonds with her over sharing the same dream. He quickly secures her a job as a waitress in the legendary (fictional) Bourbon Room on the Sunset Strip, run by Dennis Dupree (Alec Baldwin) and his sidekick Lonny (Russell Brand). As luck would have it, the Bourbon Room is about to play host to a gig by rock superstar Stacee Jaxx (Tom Cruise) and Drew and Sherrie both find their lives changed after getting caught in his wake. Meanwhile, Stacee, Dennis and Lonny have to deal with Stacee's greedy manager (Paul Giamatti), a Rolling Stone journalist (Malin Akerman) trying to get an interview and a right-wing campaigner (Catherine Zeta-Jones) trying to close down the venue. Julianne Hough is a perky and likeable onscreen presence but given her smoking hot, show-stopping dance moves in Footloose, it's a shame that Rock of Ages doesn't see fit to give her a decent dance number. The rest of the cast are something of a mixed bag: Baldwin and Giamatti are both great; Cruise is fine, but stunt-casting can only take you so far and he doesn't put a lot of effort into it; Zeta-Jones is the only one really throwing herself into the whole thing; Brand is funny but his performance is hampered by a distracting (and terrible) Brummie accent and basically every single one of them are upstaged by Stacee's scene-stealing baboon “Hey Man”. The songs themselves are decent enough, but none of the numbers are staged with any wit or imagination and there's a curious lack of energy throughout. The main problem is a paper-thin plot that barely bothers to connect all the story strands, so it's impossible to get emotionally involved in any of the underwritten characters. Scene-stealing baboons aside, there's also a painful lack of laughs throughout, meaning that the whole thing isn't nearly as much fun as it should have been. 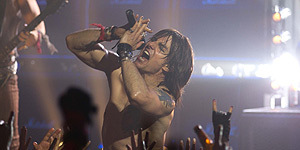 Basically, you know you're in trouble if the best thing about your rock musical is a scene-stealing baboon (“That's no way to talk about Tom Cruise”, etc) and the paper-thin plot and overall lack of laughs ensure that this is ultimately something of a disappointment.